Harts Army List is one of many publications which will enable you to research an officer of the British or Indian Armies (from 1862). The list was created by Lieutenant General Henry George Hart (1808-1878) and was published annually between 1840 and 1915. I have written other guides to using the British Army List and Indian Army List. Below is an early advert for Hart’s Army List from the Naval & Military Gazette and Weekly Chronicle of the United Service 28 March 1840. The book cost £1. What Information does Hart’s Army List Contain? Hart’s Army List contains a wealth of information relating to officers of the British and Indian Armies. Where the Regiment/Battalion was stationed, as well as the depot’s location. The records of service for the Regiment/Battalion. The location of Drill Halls for the Territorial Battalions. 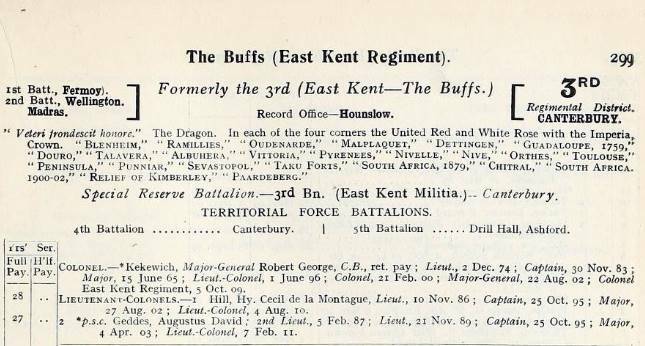 Below is an excerpt from Hart’s Army List 1914 for The Buffs (East Kent Regiment). As you can see the page is full of useful information and recorded that the 1st Battalion was stationed at Fermoy, County Cork, Ireland and the 2nd Battalion at Wellington Cantonment, Madras, India. Earlier versions of Hart’s Army List have footnotes next to the names of the officers which recorded their war services. However, in the 1914 edition, all war service was recorded in alphabetical order at the back of the book. 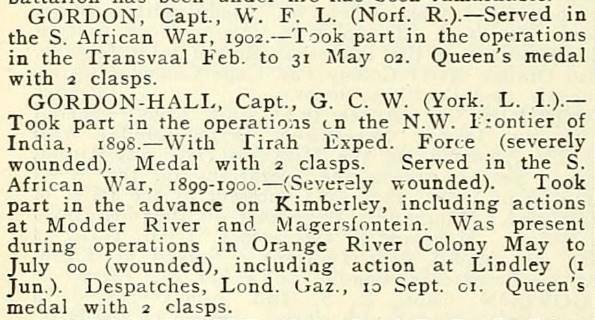 Below is an extract showing two officers who had both served in the Second Boer War. Despite his propensity for attracting bullets, Gordon-Hall managed to survive the First World War! The Queen’s Medal recorded in the statements is the Queen’s South Africa Medal. You’ll find a lot of military jargon in Hart’s Army List in the form of abbreviations and acronyms and I’ve written a guide to help you understand the pages: British Army Abbreviations and Acronyms. The great benefit of using Hart’s Army List is that it can be both downloaded and viewed online for free. 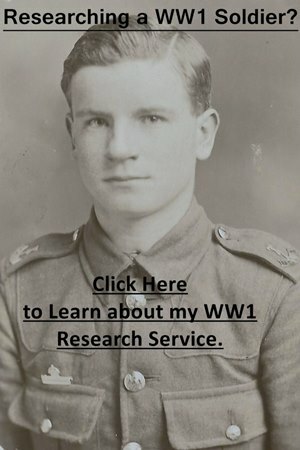 The link below will take you to the correct page on Archive.org, a website containing thousands of books no longer in copyright, where you can view Hart’s Army List. Alternatively, type “Hart’s Army List” into Google followed by the year required and it should be one of the first results. The passage below is taken from Hart’s entry in the Dictionary of National Biography, 1885-1900 by Henry Chichester and describes how Hart created his eponymous list. At that period, except in the volumes of Philippart’s ‘Royal Military Calendar’ of 1820, then some time out of print, there was no collective account, official or otherwise, of the war services of distinguished officers. Hart laboriously compiled for his own information a large number of these services from military histories and other sources. Very meagre information was then afforded by the official army lists. Hart gradually added to his own interleaved copies until, while yet a subaltern, he had accumulated so large a mass of information as to suggest the publication of an army list of his own. Aided greatly by his wife in his literary labours, Hart, in February 1839, having obtained the approval of the military authorities, published the first edition of his ‘Quarterly Army List.’ It was at once favourably received by the queen and the Duke of Wellington, and other high authorities. Hart was allowed access to the official records of officers’ services, and in 1840 published his first ‘Annual Army List,’ containing supplementary information of interest, in addition to the contents of the ‘Quarterly.’ He also projected a military biographical dictionary, specimen pages of which he issued, but never found time to carry out the work. From the first appearance of ‘Hart’s Army List’ to the present day the annual and quarterly volumes have regularly appeared. The original form has never been altered, although the book has gone through two hundred editions.